The Chanel Chance lineage of fragrances has always been marketed toward younger woman. And seems that with each flanker the age group gets bumped down even more. Chance was a good, easily worn fragrance for women in and around their thirties and younger. Eau Fraîche knocked it down to mid-twenties and younger. Now There’s Eau Tendre. In Bottle: Marc Jacobs Daisy. The resemblance has been noted before and I will confirm them. This smells like Daisy. The wet, green grassy, lightly floral top notes of Daisy. Applied: Daisy’s still there, and I can’t get over this barrier of how much it smells like Daisy. It’s like I’ve sprayed Daisy on myself instead of a Chanel fragrance. I’m waiting this one out though, because Daisy does lose that wet green and grassy scent when it progresses into its mid-stage and I want to see if Eau Tendre does as well. So far, Eau Tendre hangs onto its top notes a little better and longer and I do like Daisy’s top notes but I want this smell in my bottle with the rubber flowers not in Chanel. As Eau Tendre dries down the mid-stage has moved on from its Daisy-like personality and has developed a rose and jasmine with a bite of citrus and a woody note sandwiching the flowers. The mid-stage is probably the least remarkable part of Eau Tendre. It smells rather generic and pedestrian and kind of dull. Normally, I’d just say this smells nice and young but Chanel’s built a reputation on a solid base of very respectable fragrances that Eau Tendre hits a sore spot because it’s like a trip in an otherwise rather smooth road. This doesn’t smell like a Chanel. While I could see the appeal of the original Chance, that was a well composed fragrance that had a lot of class. Eau Tendre smells like most other recent releases with none of the familiar Chanel soul in place. The dry down is not that much better as the cedarwood in this amps up and the florals grow a bit quieter. 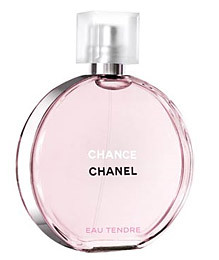 The one thing I can say for Eau Tendre is that like many Chanel fragrances it has good sillage and decent projection. I just don’t think it’s very creative or very reflective what Chanel fragrances have been for the past century. Extra: Chanel Chance is a very popular fragrance line that targets younger women and tries to introduce them to the Chanel line of perfumes. It has, so far, two flankers. The first is Eau Fraîche and the second is Eau Tendre. Design: Eau Tendre is bottled like its Chance sisters. Held in a round glass bottle with a square cap the juice inside is a light, very girly pink. The glass has a nice, light weight to it. The presentation is clean and fits well with other Chanel fragrance bottles. I do think of all the fragrance houses, Chanel’s one of the better ones in terms of packaging. Notes: Grapefruit, hyacinth, jasmine, iris, white musk, amber, cedarwood. Unremarkable as this is, I don’t doubt that it will sell well because it’s a really good reflection of where fragrance trends are headed now. So if you’re young and you want to own a Chanel perfume but you think many of them are too old or too sophisticated then Chance Eau Tendre deserves a sniff. Don’t let my disappointment color you away from this fragrance. It’s a Chanel and it’s well-done for what it is. Reviewed in This Post: Chance Eau Tendre, 2010, Eau de Toilette. This entry was posted in chanel, floral, Reviews By House and tagged amber, cedarwood, chanel, daisy, daisy in the air, grapefruit, hyacinth, iris, jasmine, marc jacobs, white musk. Bookmark the permalink.